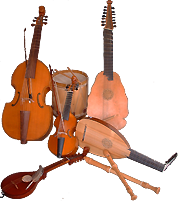 The Lachrimae Consort was formed in 1999 by a group of early music enthusiasts in the Midlands area of the UK. Three of our players were in an earlier 'consort of six', Batcheler’s Delight, based in Leicester. The members of Lachrimae are based all over the Midlands - Warwick, Birmingham, Solihull, Leicester and Ashby-de-la-Zouch. 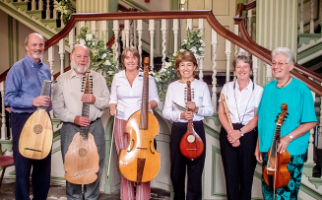 Previous members of Lachrimae have been Pam Holt (cittern and lute), Andy Benfield (cittern and lute) and Sue Peters (recorders); and we are lucky, on occasions, to have excellent guest performers including Jim Rowley (recorders), Cathy Gaskell (treble viol), Ian Gaskell (lute, cittern and bass viol) and Tony Gray (reader). We also work extensively with actors Richard Ollier and John Seeley. We sorely miss Sue Peters, a founder member, who died in 2017. All of our musicians play in other ensembles or orchestras, but are brought together in Lachrimae by a love of the very special music composed for the Elizabethan 'consort of six' during its brief, but very popular heyday, between 1575 and 1615. The famous German composer, Michael Praetorius, praised what he called the 'English' consort in his treatise on music, 'Syntagma Musicum', published between 1614 and 1620. In recent years, it has often been called a 'broken consort', but this term is too general and refers to music where very long notes are 'broken' into a lot of smaller ones. We have settled on the 'consort of six' to describe the Lachrimae grouping - the Elizabethans just called it a 'consort'. The original music used in Shakespeare’s plays, together with apt and entertaining quotations. Music from each of the four main musical sources, and the different stories behind each collection. Queen Elizabeth’s Secretary of State, and chief spymaster, maintained a consort in his house, and much of the music survives in manuscript form. This programme links the two very different sides of Sir Francis – a music-lover, and a relentless protector of the Queen’s safety. Who sent Dowland to Coventry? Based on recent research into John Dowland and his consort visiting Caludon Castle in Coventry, in 1599, including stories about the Berkeley family who invited him. The Lachrimae Consort features in a new book published by John Clarke, called 'A History of Caludon Castle'. It was recently discovered that John Dowland had visited Caludon Castle in 1598/9, together with his consort. Lachrimae Consort celebrated this discovery by performing a concert of his music in St Mary's church, Walsgrave, close to the castle, in 2007. A photograph, which was taken at this concert, appears in the book, along with the story of Dowland's visit. More information about the book can be found on Amazon or Waterstones websites. A concert of music by Anthony Holborne, Gentleman Usher to Queen Elizabeth I. View a video of our performance, played in the Great Hall of Christ Church College, Oxford where the music was first performed over 400 years ago. Both videos were kindly created by Graham Hope © 2010.